When I got up this morning a little bumblebee sat on the floor in my living room. I instantly fed the little guy with a teaspoon of honey water and watched it drink rapidly with it's little tounge. 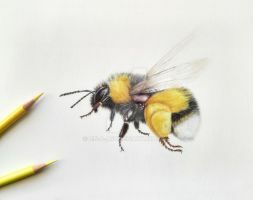 Then it flew happily out of the window - it was adorable and really made my day So here is a little drawing of a bumblebee to sweeten up your day! Oh i love it soooooo much!!! You've really cracked how light reflects off the eye. It really makes this piece pop! Awesome work. WELL DONE. This is so pleasant to look at. Aww, this so adorable! The coloring is just great! your colouring is so perfect! So lovely! The coloring looks amazing! This is just far beyond cute. I love how wet and shiny your eyes always look. I'm allergic to bees, so if I saw one, I would just stay away, but that sounds really cute (never thought that about bees before). How did you do the wings?! They look amazing!!! GAH shoot! there's a friggen bee in here. I NEED IT IN MY LIFE *___* IT'S SO CUTE!!! This is the cutest thing I've seen all day! The colors are beautiful, and I love how sweet and fluffy this little guy looks. Overall, amazing job!